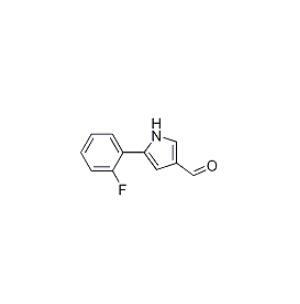 Vonoprazan Fumarate intermediate of 5-(2-fluorophenyl)-1H-pyrrole-3-carbaldehyde CAS number 881674-56-2, Molecular formula is C11H8FNO, Molecular weight is 189.1857232, it is a brown solid, belongs to the pyrrolidine compounds, is also an important intermediate of Vonoprazan Fumarate, it is a potassium ion competitive acid blocker for the treatment of acid-related diseases, such as gastric ulcer, duodenal ulcer, reflux esophagitis. Our inventory of this product is sufficient, it can meet the market demand at any time. Looking for ideal 881674-56-2 Manufacturer & supplier ? We have a wide selection at great prices to help you get creative. All the CAS 881674-56-2 are quality guaranteed. We are China Origin Factory of Intermediate of Vonoprazan Fumarate CAS NO 881674-56-2. If you have any question, please feel free to contact us.